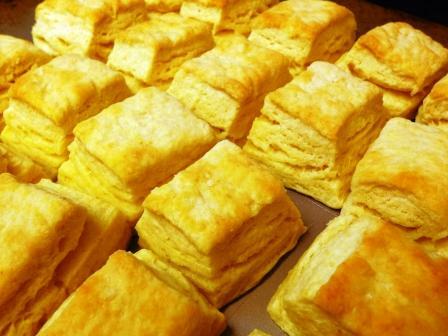 I love buttermilk biscuits. When I was growing up, my mom would make them regularly for breakfast. We’d smother them with butter and jam or honey, and eat them by the truckload. Now that I’m baking them for my own crew, I’ve gone looking for the Ultimate Biscuit recipe. It couldn’t be too complicated, and I didn’t want to use shortening. As it turns out, my current favorite recipe is easy to prep in advance. I can grab a bagged mix out of the freezer and have it ready for the oven in less time than it takes to preheat! This recipe can be stirred together by hand. The colder the butter and water are, the better it flakes, so its’ not something that needs to be beaten to death. 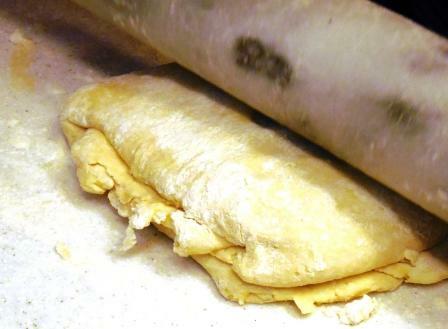 Next, it gets rolled out on a well-floured surface. Then, fold in thirds like a letter. 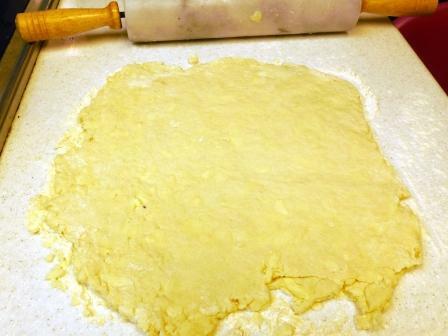 I use a bench scraper to pick up the dough so that it doesn’t tear. And roll it out again. 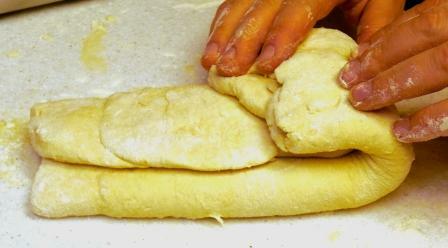 The more times you roll and fold, the more layers the biscuits will have. 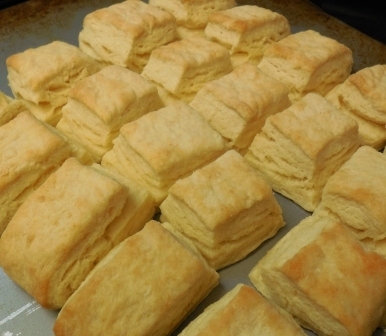 I generally roll and fold twice; this gives me biscuits with about a dozen layers. 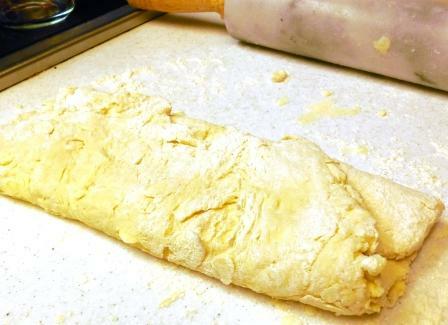 If the dough gets too warm, it will turn into a sticky mess, so there’s a small window of opportunity for the rolling stage. Of course, you could probably stick it in the fridge to cool off for a half hour, if necessary. But… the oven is preheating! No time to lose! I cut my biscuits into squares with the bench scraper. 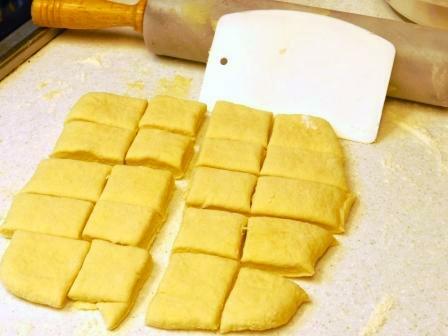 This way, there aren’t any scraps to have to try and make into more rolls – and no tough biscuits, either. These are arranged with just a little space in between them on a cookie sheet, and baked. Add water and stir till just combined. Turn out onto well-floured counter. Roll out till about ½” thick. Fold in thirds lengthwise, turn 90° and fold in thirds again. Repeat previous two steps. May repeat once or twice, but stop if the dough is getting sticky or warm. Roll out 1” thick for cutting. Arrange on baking sheet about ½” apart. Bake at 350° for 10-15 minutes, until golden brown. If making for the freezer: Do steps 1 & 2, then freeze and label. When ready to bake, pull out of the freezer and mix immediately. 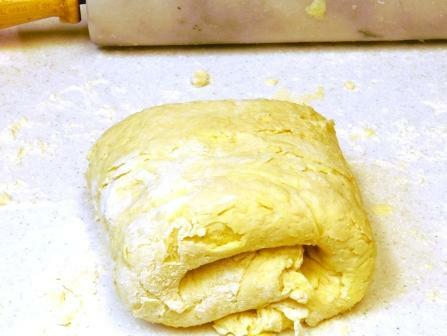 The colder the dough is, the more flaky the biscuits. 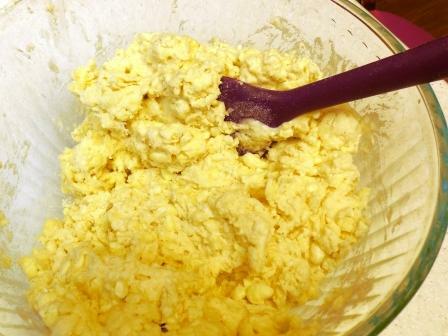 This entry was posted in Baking, Comfort Food, Make-Ahead Mixes and tagged biscuit mix, buttermilk biscuits, flaky biscuits, homemade biscuit mix, mile high biscuits. Bookmark the permalink. from some of the information you present here. Please let me know if this okay with you. I’d love it! I look forward to seeing the ping-backs. Sure – I’d enjoy hearing from them!